How Did Mary Queen of Scots Send Secret Messages? Mary Queen of Scots, the controversial 16th century royalty, met a rather (spoiler alert) grisly end. And it all had to do with a cracked code. But how did Mary actually send her secret messages—the ones that she ultimately lost her head over? 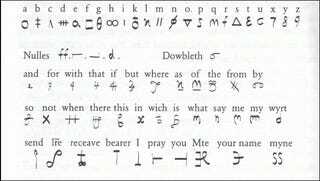 Mary communicated using a cipher that she changed repeatedly, substituting letters for different symbols and essentially creating a new alphabet that could be deciphered by anyone who had the code. She wrote letters communicating with Catholic allies (England wasn’t too happy with the fact that she wasn’t a Protestant) and would hide them in a hollowed out bung inside beer barrels that could be smuggled to the receiver. But in 1586, Mary was found out and entrapped by people who believed she wanted to have Queen Elizabeth I killed (Mary would have taken the throne if that had happened) after her code was broken. The cipher she used is below, courtesy of the Black Chamber. National Geographic covered the scandal for TV and you can watch a clip here if you want to learn more. It’s pretty interesting. She’s unaware at the time that the English state, particularly Francis Walsingham, the secretary of state, has employed a man named Thomas Phelippes, who’s a brilliant cryptographer who has what to the English is a new method of cracking these codes. It’s known as frequency analysis and works by studying how commonly used letters appear when enciphered. Mary, Queen of Scots has gotten extra attention lately thanks to a new Hollywood blockbuster that comes out today. Admittedly, I haven’t seen the movie yet, so I don’t even know how the story of Mary’s cipher is covered. Did you catch a screening yet? How did they cover the cipher in the film? Sound off in the comments. Correction: An earlier version of this post said that “England wasn’t too happy with the fact that she was a Protestant.” I, of course, meant to type “wasn’t” a Protestant. I apologize for the error. I also wrote “thrown” instead of “throne.” Again, I apologize for being an idiot.